Rose milk pudding recipe - How to make sweet puddings at home. It is my 2nd day in Dubai and this morning we prepared rose milk pudding. These days puddings are available ready made in the shops, but nothing like homemade. So here I will give you a recipe on how to prepare the rose milk pudding. Boil the water and add China grass to it. After china grass get melted add milk to it and keep stirring. When it becomes semi liquid consistency, add rose milk to it. Switch off the flame and pour it into a round plate. Garnish with dates and sesame when it gets cooled. Serve chilled for better taste. 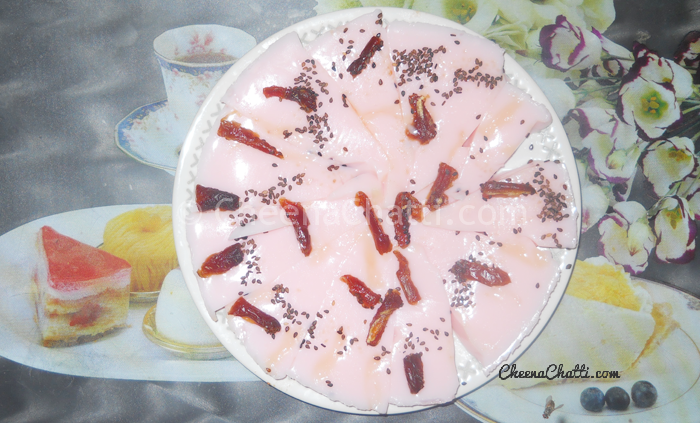 This entry was added on March 5th, 2013 by Renoos in Desserts and tagged with rose milk pudding, easy pudding recipes, pudding, easy pudding, dessert, dessert recipes, snacks, milk pudding, how to make pudding. Last revised on April 4th, 2018.